Here is a short tutorial on how to add a live tile clock to Windows 8 Start Screen. One of the important things which is missing in Windows 8 is its ability to show the current date and time on the Start Screen unless you bring out the Charms bar (Win + C) and hover your mouse on that. If you are also among one of those many Windows 8 users who are missing a live tile clock on their Windows 8 Start Screen, you would be happy to know that you can easily add a live tile clock to your Windows 8 Start Screen. 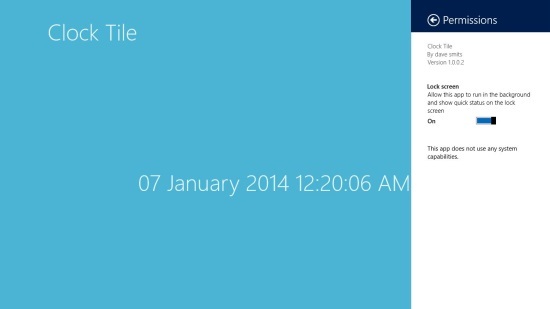 Microsoft offers many third party live tile clocks (both free and paid) which can be added to your Start Screen. Some of them come feature-packed while others are simple and basic. Here we are going to review one such simple and elegant live tile clock, named as Clock Tile. Let’s see how you can add Clock Tile to your Windows 8 Start Screen. First of all, go to Windows Store and search for the app using Win + Q key combination. You can also look for it in the Tools category or click on the link given at the end of this article to view it directly in Windows Store. Once you reach to the app’s page, click on Install. If the app takes too longer to install or shows a pending status, checkout how to fix pending status in Windows Store. Once the app is installed, it’s tile would be shown on the Start Screen. Click on it to launch the app. A prompt would be displayed asking your permission to let the clock run in background. Click Allow. The app’s tile would now become a live tile clock!! Click and drag it to place it on the desired place on Start Screen. Note: If you don’t want to keep this tile live and want a static tile back, you can change the settings from within the app’s interface though the Settings charm. Free live tile clock for Windows 8. Classy look and matching font with Windows default theme. 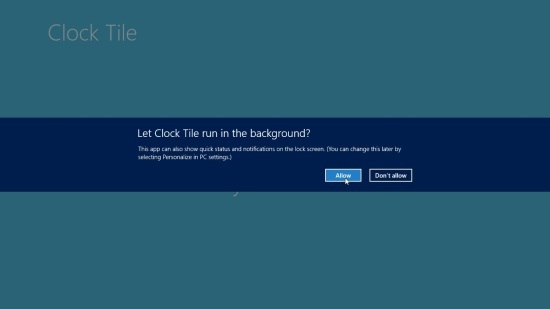 Clock Tile is a perfect live tile clock for Windows 8 Start Screen. With this simple app, you won’t ever find your Start Screen incomplete. Get it free and give it a try. Share your thoughts about the same via comments. 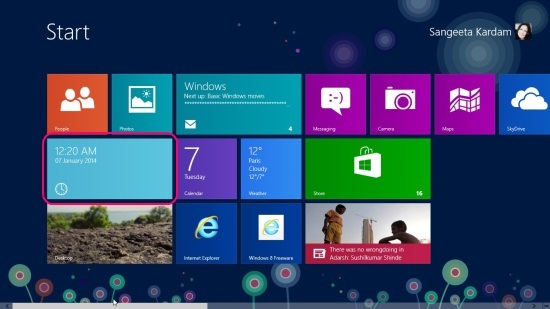 Also check out how to set any picture as Windows 8 Start Screen background.